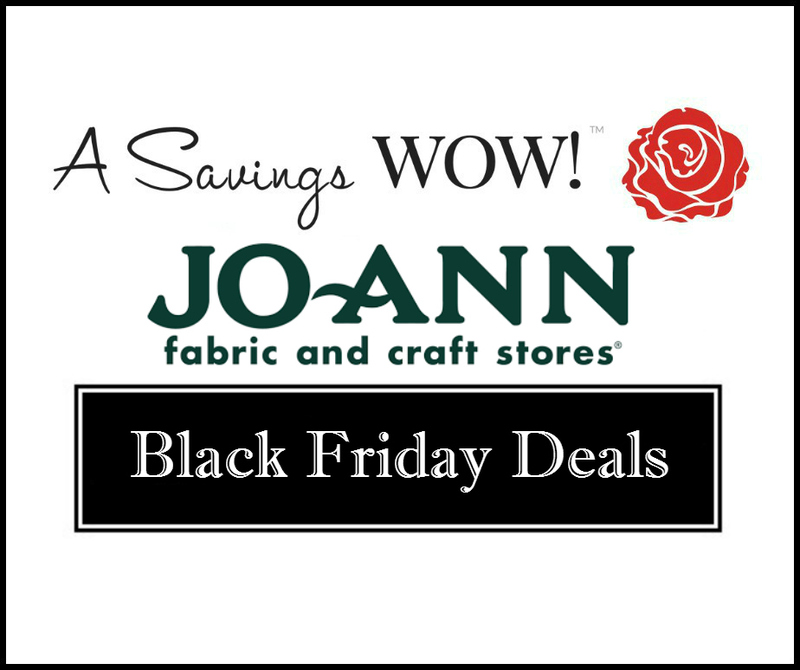 Jo-Ann Black Friday Deals | A Savings WOW! The Jo-Ann 2015 Black Friday deals sneak peek is here. You can view the entire ad here. Thank you to Happy Deal-Happy Day for compiling this list. Store Opens 6am, Friday November 27th! *6am-noon only: 25% off your TOTAL purchase coupon – includes sale items! *70% off Holiday Cheer Ornaments, Ribbon, Bows, & Deco Mesh – sale $1.19-$8.99 ea. *70% off Holiday Cheer Floral Stems & Picks – $0.44 – $3.89 ea. *50% off Big Twist Rainbow Classic Yarn – $4.99 ea. *60% off Entire Stock of String Beads – $1.19-$7.99 ea. *40% off Singer Sewing Machines – $35.99 – $599.99 ea. *40% off Baby, Buttercream, & Big Twist Yarns – $1.91-$5.99 ea. *30% off all Lion Brand, Bernat Blanket, Caron One Pound, & Selected Chunky Yarns – $2.79 – $$7.69 ea. *Save $100 on Cricut Explorer One Personal Electronic Cutter – $149 ea. *All Cricut Cartridges (normally $29.99-$49.99) – $14.99 ea. *Save $100 on Cricut Explore One Bundle – $179 ea. *Save $100 on Cricut Explore Air Wireless Cut & Design System – $199 ea. *Studio 71 159pc Professional Artist Set (normally $79.99) – $39.99 ea. *50% off Paper Crafting Supplies, Dies, & Cricut Accessories – $0.39 – $124.99 ea. *60% off Fine Art Canvas – $0.99 – $27.99 ea. *Americana, Ceramcoat, or Folk Art Acrylic Paint (normally $1.49) – $0.99 ea. *60% off 48″ & 72″ No-Sew Fleece Throw Kits – $7.99-$13.19 ea. *60% off Entire Stock of Ottlite Lighting – $3.99 – $123.99 ea. *60% off Entire Stock of Fiskars Papercrafting, Sewing & Quilting and Cutting Tools – $1.59 – $47.99 ea. *40% off all Irons & Steamers – $8.39 – $119.99 ea. *9am – 1pm only: 25% off your TOTAL purchase coupon – includes sale items! *60% off Entire Stock of Apparel Fabrics – $1.99 – $15.99 / yd. *70% off Holiday Cheer Floral Wreaths & Garlands – $4.79 – $35.99 ea. *50% off all Kids’ Learning Crafts, Toys, & Kits – $0.39 – $49.99 ea. *69% off Fabric Quarters – $0.75 ea. *Lion’s Brand Vanna’s Choice, Caron Simply Soft, or Deborah Norville Everyday Yarn (normally $3.99-$4.99) – $2.79 ea. *62% off Steamtek Steam Iron (normally $15.99) – $5.99 ea. *50% off Gutermann 80 Spool Thread Tower (normally $159.99) – $79.99 ea. *66% off Buttercream Watches (normally $29.99) – $9.99 ea. *66% off Plush and Faux Fur Throws (normally $29.99) – $9.99 ea. *60% off all Functional & Decorative Dressforms – $39.99 – $115.99 ea.